Great place, with a rustic and original decoration, where you can taste the typical food of the area as well as taste a great wine list and the best of all is to do it in good company. We are in Avda de Torrox s / n (better known as the race). On Saturdays there is callus. We want to invite you to learn more about our place and our excellent cuisine. Whether you opt for classic dishes or innovations: our menus and the seasonal offer will satisfy the most demanding palate. Located in the white village of Competa, there is the Casa Paco tavern restaurant, right in the center of the town, in Plaza Almijara. In this restaurant you can taste typical dishes such as tripe, fennel stew, goat in almond sauce, chicken with Cómpeta wine, Rabbit with garlic, leg of suckling lamb ... among others. We also offer a variety of tapas. On weekends we will have fresh seafood. Large terrace to enjoy the sun and tranquility of the Almijara square. La Esquina de Miguel is undoubtedly a pleasant and cozy place where you can enjoy your terrace tasting your breakfasts, lunches and a variety of tapas located next to the parking and main businesses of the town. La Tapería Restaurant A proposal of essentially Mediterranean cuisine that stands out for its good work with tapas. You will find from traditional dishes to some more avant-garde. Its location, its outdoor terrace in the main square and the gift of people makes La Tapería restaurant not a simple place to eat but also a usual meeting point among the people of Cómpeta. Travel to a world of delicious flavors. 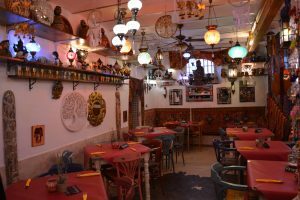 In the Tequila Hierbabuena Tavern, located in Cómpeta, you will find the most characteristic Indian dishes of the Asian country. Your local, intimate and colorful, the personalized attention they will give you and the spiced and flavored delicacies that will serve you, will make this culinary experience perfect. A little curry a year does not hurt! Maria Restaurant is a Restaurant within the facilities of the Balcon de Competa Hotel. It has a varied menu adapted to the needs of our customers. It has one of the best views of Competa and in summer the service moves to the Hotel Terrace. Since 1890, the largest winery in the production and sale of Muscat wine from Cómpeta. In 1986 it was adapted to coffee-bar, until today it preserves its charisma, as well as its press, which can visit and move to that time, enjoying a good wine. Cómpeta in Roman language means "crossroads", there is La Venta de Palma, located at the junction of the roads that separated the trade between Malaga and Granada, where the arrieros made their stop for their coffee, drink, tobacco, and a talk time about work. This old Sale of Palma, today also known by locals as "Catalambre" (trap formerly used for bird hunting), is known for its location, because everyone who passes by is trapped.